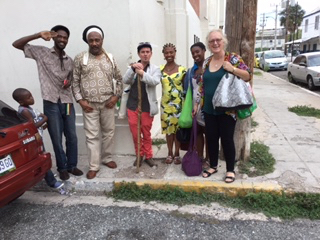 The delegation visit was organised by Learning Links International CIC, with support from the North Wales Jamaica Society, with delegates paying their own way. Yasus Afari, invited the delegation and supported the programme throughout the week. Delegation members in Kingston after visit to Institute of Jamaica. The British High Commissioner, David Fitton, and Welsh born Deputy Head of Mission, Julia Sutherland, welcomed the delegation and their guests to a Lunchtime Reception at the British High Commission in Kingston and were interested to hear about the links being explored with a wide range of organisations in Jamaica who had confirmed their interest in exploring making links with organisations in Wales. Prof Mervyn Morris, the Poet Laureate of Jamaica, extended a welcome to the delegation and was pleased to receive greetings from Ifor ap Glyn, the National Poet of Wales, and he took an active interest in the research and his own obvious Welsh links. Principal Dr Walters, from Edwin Allen High School in the nearby town of Frankfield, agreed that they would like to link with Ysgol Dyffryn Ogwen. Principal Jasford Gabriel, from Manchester High School in Mandeville, Jamaica, expressed an interest in linking with a school in North Wales, possibly in Holyhead. Following discussions with Mrs Maxine Headlam, Regional Director of Education for Clarendon and St Catherine Parishes, it was agreed to explore with the Jamaican Ministry of Education ways to support the development of the new approach to school linking, as Jamaican school links are no longer supported by the British Council. The Jamaican Commission for Cultural Development, JCDC, expressed an active interest in linking with Arts Council Wales, to invite Welsh Artistes and Welsh Bands to Jamaica and to bring Jamaican Artistes and Reggae Bands to Wales. JCDC is also supporting the research into links between poetry and Eisteddfod in Jamaica and Wales. Jamaica’s current “Festival” grew out of the introduction of Eisteddfod in Jamaica in 1880’s. Director, Vivien Crawford, welcomed the delegation to the Institute of Jamaica which manages heritage organisations. Vivien gave a very informative presentation on the history of Eisteddfod in Jamaica. Rheinallt Foster-Jones, Director of the People’s Collection in Wales expressed interest in developing an information technology hub in Jamaica, where people can share their connections to Wales on the People’s Collection website. It was agreed by Vivian Crawford that this link will be made with the Jamaica Memory Bank online project which is managed by Bernard Jankee. The Director of the Museum of Jamaica, Jonathan Greenland, is Welsh and living in Jamaica, and he is interested to link with the Museum of Wales and he has also agreed to support the set up of the Jamaica Wales Alliance, and to help to manage to keep the momentum going between Jamaica and Wales. Professor Hubert Devonish, Head of the Jamaican Language Unit situated on the Mona Campus of the University of the West Indies, took time to discuss how to move forward his important work to gain full recognition and respect for Jamaican, the language of Jamaica. NWJS to link up with Welsh Language activists in Bangor and area, and with Accreditation Bodies to possibly arrange a conference at University of Bangor in 2017. Professor Fred Hickling welcomed members of the delegation to his home and discussed ways he could support the development of links between Jamaica and Wales. Prof Hickling has been a researcher in the field of psychiatry for over 40 years, with interests in African Caribbean mental health, schizophrenia, personality disorder, community psychiatry, psychotherapy, political psychology and cultural therapy. His work on cultural therapy is groundbreaking, and he has offered to come to North Wales to run a workshop on exploring identity through poetry and drama. Not sure of best link for this. Other links may include Rotary International clubs and women's groups through the associated Country Women of the World. The Mayor of Clarendon, Cllr Scean Barnswell, for his enthusiastic support and Jamaican gifts to help us keep warm back home in Wales – woolly hats and a scarf in Jamaican colours! Principal, Jasford Gabriel, from Manchester High School for much needed help with logistics, and encouragement with the development of school links. The new Director of Ministry of Education Region 6, Maxine Headlam, for keeping Tan, the Dragon we took to Jamaica some years ago, safe and well in her office, and for willingly taking on the idea of developing school links with Schools in Wales. Courtney Minors, for accommodation and transport to and from his hostel, Kingsworth, high up in Jacks Hill, Kingston. Audrey West and her daughter, Iola, and John Wyer’s son, Felix, for their support to the delegation as our guests.